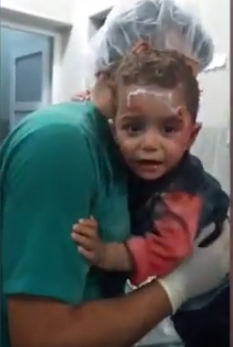 An emotional video of a traumatised baby boy, covered in blood, in Syria clinging on to a nurse after his home was hit by an airstrike has been released. 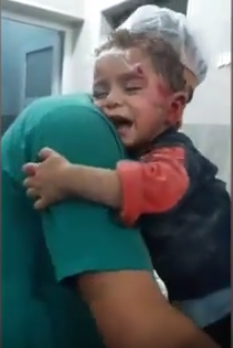 The video was posted by the Syrian American Medical Society who reported that he had arrived at their hospital in Aleppo with his brother yesterday. The medical situation in Aleppo is so dire that the only neurosurgeon left in the city performed brain surgery on the floor without anesthetics. They wrote “This is what #ChildrenOfSyria endure everyday”. 13 deaths were recording by the SAMS’ medical personnel that day, and the hospital treated 40 wounded, the Daily Mail reports. He was hit in an airstrike. We don’t know whether it was the Russian or Syrian government. They also revealed the shocking fact that in the east of the city, there are only 29 doctors left and a nurse said that ‘Aleppo has been forgotten’. Life in Aleppo has become very dire. No camera or no pen can describe what we’re experiencing here. Hospitals are overwhelmed. There’s a severe shortage of medical supplies and specialized doctors. There’s only one neurosurgeon, two general surgeons, and three orthopedic surgeons left in the besieged city. 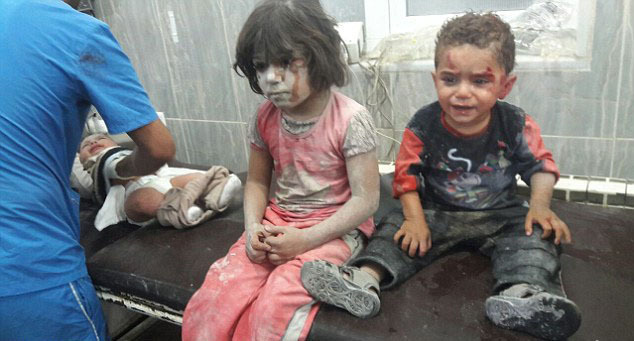 The bombs have been so destructive that children cannot return to the underground schools. Since Russian bombings began a year ago, thousands of civilians have been killed and at least 100,000 children remain trapped in the city alone. SAMS operates 106 medical facilities to provide for citizens in need. You can donate here to support them in providing this emergency care.